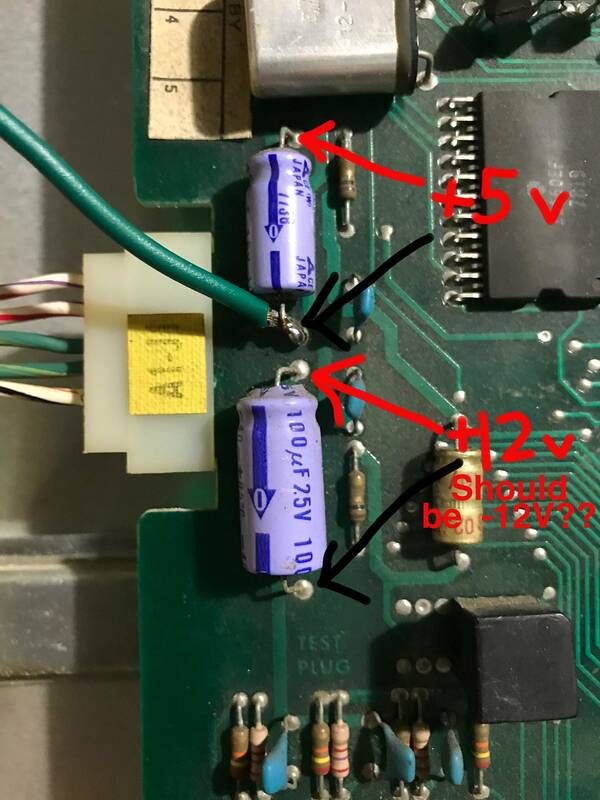 » Forum » Tech » Tech: Early solid state » Gottlieb System 1 MPU...why is -12v turning into +12v? 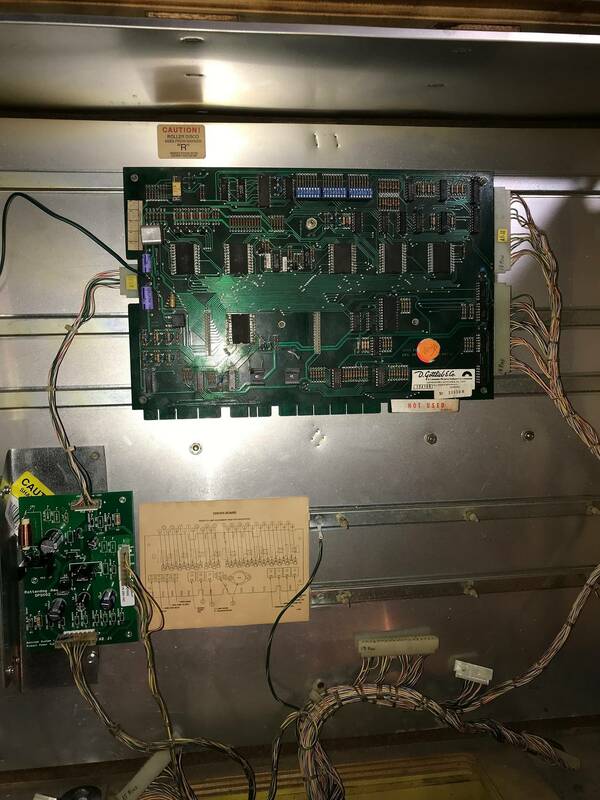 » Gottlieb System 1 MPU...why is -12v turning into +12v? Gottlieb System 1 MPU...why is -12v turning into +12v? I will preface this by saying I'm following the pinrepair.com Gottlieb system 1. My power supply is putting out the correct voltages of +5v and -12v. When I plug in the MPU and test for voltages at capacitors C16 and C17, I get +5v on C16 which is perfect, but at C17 it tests as +12v. It should be -12v. What would cause this? My multimeter is set to DCV and i'm testing the C16 and C17 capacitors with the red lead on the + side(top) of the capacitor and the black lead on the - side (bottom) of the capacitor. I'm testing the right way, correct? Where are you putting your leads? It's possible they're just backwards. Here is how I'm measuring voltages. Because of the comment by @zacaj, I switched multimeter leads for capacitor C17 and got -12v. Still, why is the -12v from the power supply turning into +12v at the MPU? Leads are reversed for the -12V. Black lead always goes to common (ground). Ground is connected to the positive end of the -12V cap (C17) so you need to put black lead to positive lead of C17, red lead to negative end. Thank you. So, I do have -12v at the board when measuring like this. 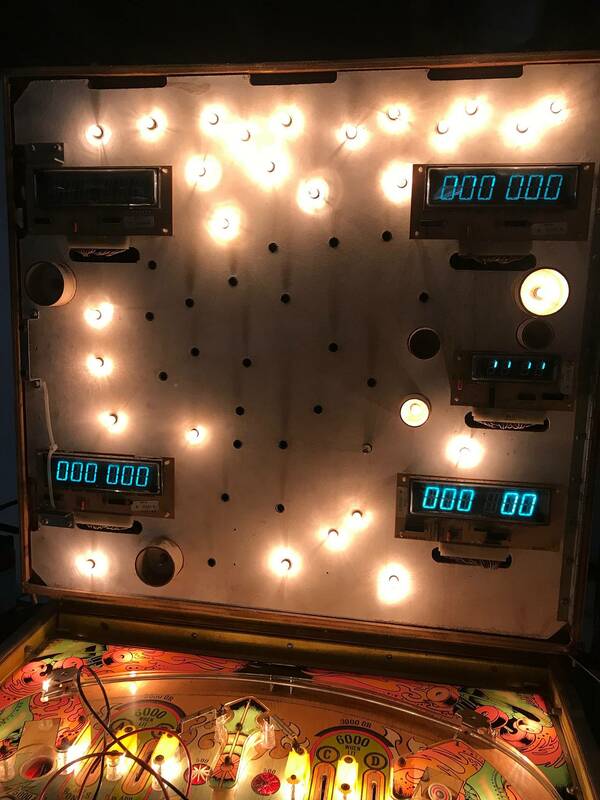 The next step is to connect the two score displays (J2 & J3) to the MPU and only have one score display plugged in when powering on. I don’t get anything on the display when powering on. I tried two other displays and get nothing as well. This looks like a dead MPU, correct? Is it best to try and repair this board or go the route of purchasing a new NI WUMPF board? Could be bad CPU board but first verify voltages get to the display boards. The 5VAC would be coming from the transformer and the 60VDC would be coming from the power supply board. So after measuring voltages and confirming I had voltage going to the displays...they started working. Not really sure how. Maybe a dirty connection got reseated or something. Anyways, here's where I'm at. Two displays work, one does not, one is missing a digit and the smaller credit display comes on sometimes. I have moved around the displays and the problems follow so I know it's not connector related. after extensive tinkering and research, I've come to the conclusion that the CPU is too far gone with battery acid corrosion. The game boots and flashes the high scores to date but I cannot credit up or start a game. I jumpered the common wire on J6 of the CPU to both coin-up wires on J6 and nothing happens. There's quite a bit of green corrosion around that area. The driver board looks great so I'm pretty sure the CPU is the downfall in this particular game. My question now is, I have a Gottlieb Charlies Angles coming soon. Will I be able to test the Charlies Angels CPU board in the Roller Disco? You could changing roms and jumpers I think. Just get a all in one board.